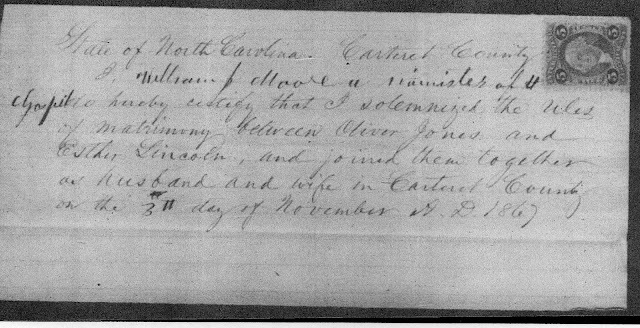 Oliver Jones And Esther Lincoln Were Married By William J. Moore. Oliver Jones and Esther Lincoln Jones were my 2nd great grand uncle and aunt. Oliver was a brother of Alexander Hamilton Jones, my 2nd great grandfather. 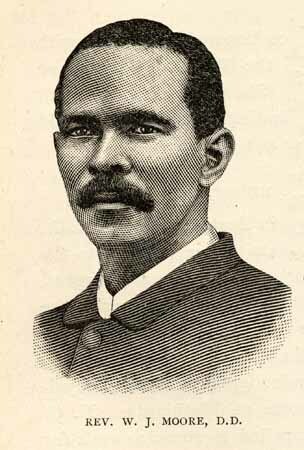 I found online a terrific resource which featured an etching of minister William J. Moore. It's the electronic edition of "One Hundred Years of the African Methodist Episcopal Zion Church or The Centennial of African Methodism," by James Walker Hood. The electronic edition is part of the University of North Carolina at Chapel Hill's digitization project called "Documenting the American South." I was delighted to find that the book includes an etching of William J. Moore and background information about the minister. I am so glad you found this information!!! Great research! !